Next Wednesday afternoon, 9 May, I am happy to announce that I will be making a presentation for the Vienna Evaluation Network on “Evaluating advocacy and communication: challenges and solutions”. Further information is available here. All interested persons are welcome to attend! As a long time fan of contribution analysis for advocacy evaluation, I was very interested to see this new handbook on Contribution Analysis in Policy Work – Assessing Advocacy’s Influence (pdf). The handbook takes you the steps of contribution analysis with examples provided. 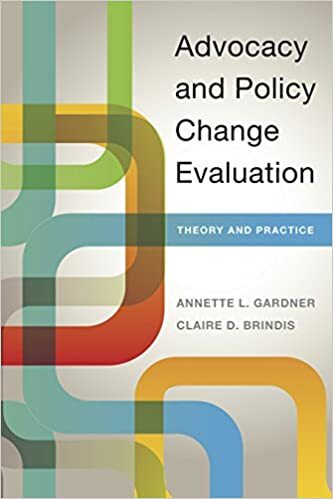 An evening reception for the launch of Annette Gardner and Claire Brindis’s book: Advocacy and Policy Change Evaluation: Theory and Practice that I mentioned last week. DAVID DEVLIN-FOLTZ directs the Aspen Planning and Evaluation Program at the Aspen Institute and serves as the Aspen Institute’s Vice President, Impact Assessment. JULIA COFFMAN founded the Center for Evaluation Innovation. She has more than 20 years of experience as an evaluator, and now specializes in the evaluation of advocacy, public policy, and systems change efforts. SUE HOECHSTETTER is the Senior Advisor for Foundation Advocacy and Evaluation at Alliance for Justice and helps amplify citizen’s voices in the policy process. Another great new book – this is the first ever book that looks in-depth at concepts, design, tools and methods to conduct advocacy and policy change evaluation – with plenty of practical examples and case studies. I also happy to report that I provided input for one of the case studies which is on an evaluation I carried out on Oxfam’s GROW campaign. The website Better Evaluation has many great resources and explanations of evaluation approaches, processes and methods. I just came across this page on Evaluating Policy Influence and Advocacy that details well the methods and types of advocacy/policy influence – well worth a read!